The council consultation for residents on the future of Twickenham, from 22-24 July 2010, drew a large audience over the three days. Additional information: Rethink on the Riverside, a report prepared for the Twickenham Society's group and still pertinent to river issues. 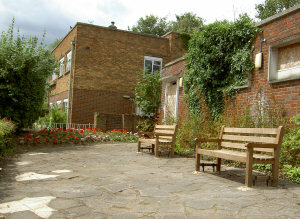 The council opened up a small terrace area in front of the derelict ladies' toilets (but not the toilets themselves) with new benches and some plants. This has been quite popular, especially with young people. Following representations from three members of the public, John Anderson on behalf of the Environment Trust for Richmond upon Thames, and local residents Prof Jack Betteridge and Yvonne Hewett, the council cabinet discussed the officer's report. They agreed to end the association with Countryside Properties for redevelopment of the old swimming pool site. They discussed whether to end financial support for the rental of the offices the Environment Trust uses at Phoenix Wharf on Eel Pie Island (the wording in the officer's report was somewhat ambiguous on this matter). As the three public speakers were at pains to point out, the Trust as a charity has been established in the borough for many years and has always received rent support from the council, in common with many other charities. Council leader Cllr Nicholas True clarified that the funding for the Trust has not been completely cut off, and funding for their premises will be examined in the context of all funding for charities when the time comes. Cllr True was at pains to stress that there will be full public consultation with all parts of the community on the future of the poolsite. 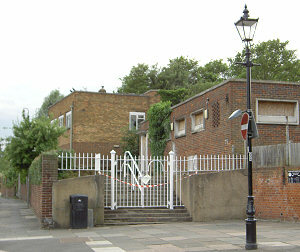 The entrance to the derelict ladies' toilets, at the corner of Water Lane and the Embankment. Work has already started to tidy the area and make it look better. On the agenda is the riverside, ending the association with Countryside and looking to an immediate low-cost project to open up of part of the old swimming pool, and setting up a steering group to develop ideas for the poolsite. 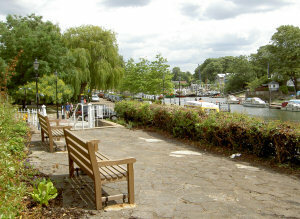 As you may be aware, the local elections at Richmond upon Thames on 6 May returned a Conservative Council, committed to halting the Twickenham Riverside redevelopment. This scheme included the River Centre- the public benefit building that the Environment Trust has been working since we won the Twickenham Challenge, initially in partnership with the former Conservative administration and then with the recent Liberal Democrat council. Although naturally we regret the ending of our involvement, the overall outcome for the Trust has been very positive. The partnerships for environmental and sustainability education using the resources of the river are thriving and have enabled us to develop a strong education strategy. We are continuing to build on these partnerships and projects, and hope that at some point we will be able to provide a physical hub on a site outside Twickenham. Our development of the River Centre idea has shown us that a great many people in the borough appreciate the need for such a centre and the community focus it can provide for year-round leisure and education activity for all ages, as well as the raising of awareness of key issues such as community resilience and climate change. There is therefore a major opportunity to build upon the achievements of the project. We would like to thank all of you who have given so generously your time, ideas, expertise and financial support, including the many organisations that have become part of the team, lending ideas and enthusiasm. We have been especially lucky to have the stalwart support and wise counsel of our patron Sir David Attenborough. We hope you will want to be kept in touch with our developing plans, and we hope to see some of you at our AGM on 10 June at Ham House Orangery. On 6 May, the Conservative party won the majority in the local elections. At the moment, it is unclear what their plans are for the riverside and the old swimming pool site, so it's a matter of watch this space. Convene a new Commission for Twickenham – to plan Twickenham revival, support ideas for Twickenham Riverside and inform a new master plan (Section 8. REAL CONSULTATION IN STRONG COMMUNITIES). After 6 May 2010: In our first fortnight in office, we will: CREATE a taskforce to stop profiteering housing speculation on Twickenham Riverside. In our first 100 days in office, we will: CALL a Conference to plan a green alternative for Twickenham Riverside and set up a Standing Commission for Twickenham revival. How any plans for the Riverside would be managed, and how they would be funded without any enabling development is currently unclear. We will update you when we have any new information. Clive Chapman's walkthrough shows how the redeveloped poolsite can look when it's completed. The River Centre will be a place where people of all ages can learn about the environment, the river and sustainability, learn to build a boat, fish or row, and watch the world from a great café. Look here for more information on its features and what it can provide to the community. 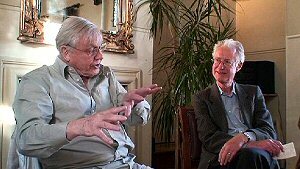 Video: Sir David Attenborough and Bamber Gascoigne talking about the River Centre, on YouTube. You can also view the video on this website MP4 or WMV. With an update on the River Centre, and news of the environmental, leisure and art classes and training programmes the Trust is running. 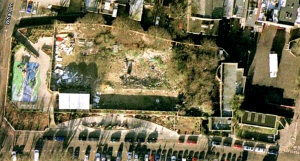 Twickenham Poolsite from the air - showing how little of the site is actually in use, and its surroundings. The Jubilee Gardens play area is on the left. The three-panelled white patch is the roof of the café. Approximately four-fifths of the site is fenced off and empty. 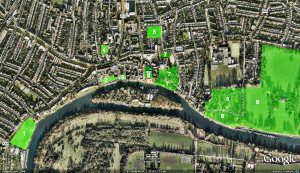 Green Space in Twickenham - showing how much of Twickenham is already green space, and indicating the area that would be public open space in the projected poolsite development. The areas across the river, Ham Lands and the grounds of Ham House, are shown but not highlighted. Page last amended 25/7/13 . All photographs and text on this site are © Twickenham Riverside, unless otherwise stated.